Then you actually need to do some producer-like things to begin with. 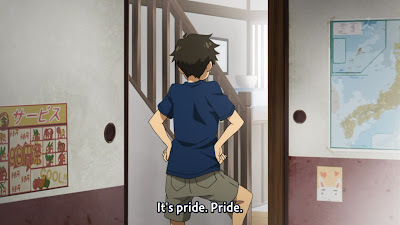 The episode began with Iori seizing the chance when a reporter came to her house (to talk about the Minase Group, meaning Iori's father and older brothers) to get some publicity for herself and Ryuuguu Komachi. While it didn't work out spectacularly, Iori stayed headstrong and kept going for it. She was chastised afterwards by Producer, who explained that not all publicity was good publicity, and that she should come to him in the future before attempting such an act. Iori's quick response was absolutely correct, although Producer didn't seem fazed by it. 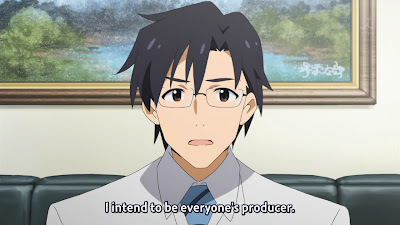 I find his attempts to state that he's everyone's producer a little weak; Ritsuko is handling Ryuuguu Komachi, which should give him the time to handle the other girls. It's true that he's a producer, which means that Iori can come to him, but he should have added Ritsuko to his sentences. Office politics can make or break everything. I still have a lot of pent-up resentment from his actions in the previous episode, even by the end of this one. Is it because it's a completely different shade of green? While Iori spoke about how she hated the reporter's way of twisting everything back to her family (to be fair, he was there to talk about the Minase Group), Hibiki commented that she and her older brother always argued too (since he teased her about being an idol). 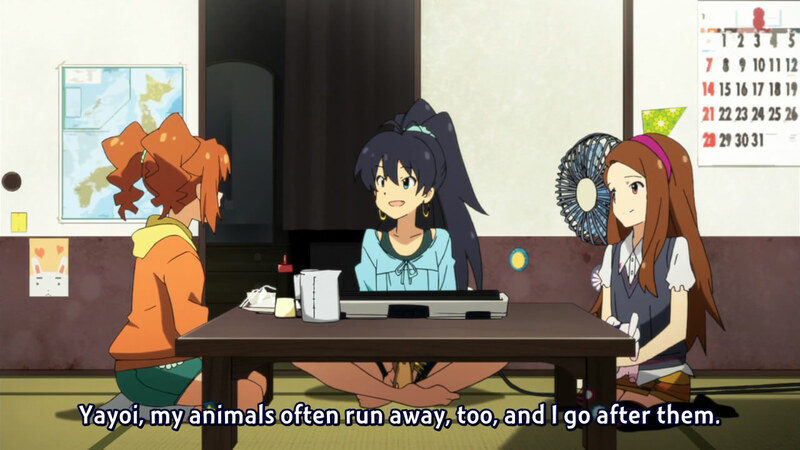 Yayoi revealed that the 6 children in her family (including herself) had minor squabbles all the time - and, in the same breath, invited Iori and Hibiki to dinner at her house. I found that quite interesting; the anime has made it very clear since the first episode that Yayoi's family was poor. It's nice to see her inviting friends over to share whatever it is that she has; it's a sign of a big heart. 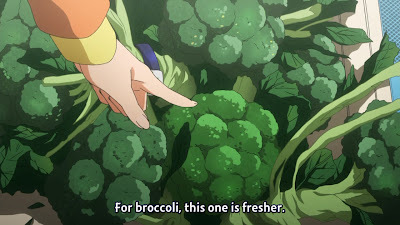 The trip to the grocery store was a lesson for Iori, who hadn't really been, and showed Yayoi's awesome networking skills, as the butcher even knew her name and put "half-off" stickers on whatever she picked out. Are they just like animals to her?! Seeing Yayoi's two-storey house made me think about what the anime's definition of "poor" was, considering it didn't look too shabby. I suppose the idea is that having all of that along with 6 children is pretty hard. Either way, the siblings seemed very close with each other (with the parents out at work until late at night) and greeted Yayoi's friends with generosity. It was nice to see that, despite having been obviously spoiled in previous episodes, Iori really seemed to have matured at some point. She wasn't uncomfortable in her surroundings, despite obviously not being used to it. Her only comment about the house was that it was smaller than Jean van Jean's (that would be her dog), but she didn't harp on it. While Hibiki was much better with the young children than she was, she didn't sit in a corner and complain; instead, she played along. Conversely, these two have a lot of balance together. 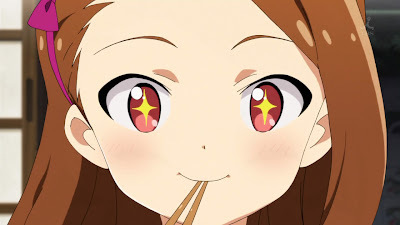 Iori's reaction to dinner being of only rice and beans was funny, and it could have quickly turned into her looking down on them had she not adjusted so quickly. I did find it endearing that the children thought of things like making Tuesdays the night of the Beans Festival; with so many children, food would naturally be a huge cost if not for such ideas. The secret sauce that even Iori loved makes me suspicious; what was it? Dinner proved to be a huge success, with all the children eating with large helpings (and some surprise bitter-melon for Hibiki, who hadn't been able to find it at the grocery store). 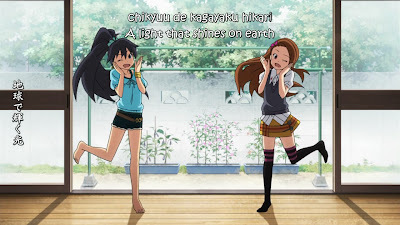 When Yayoi commented that it was nice to have Iori and Hibiki over, and that she wished they could come over everyday, the problems began. 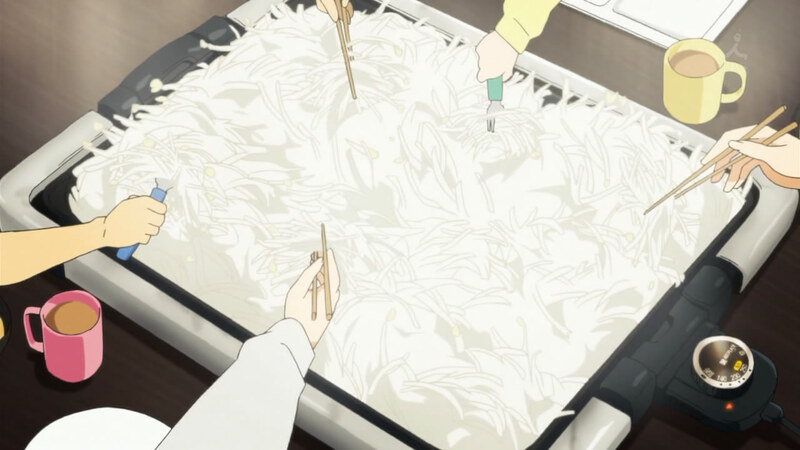 Yayoi's oldest sibling seemed down (most likely due to his inability to do more for the family) and when a younger brother took the opportunity to take some of the beans off his plate, the brother hit him and a tense situation began. Some people would be offended with such a comparison. Unable to handle his feelings, the brother ran away after saying some very harsh words to Yayoi (very typically). She recovered well, saying that he would come back when he was hungry. However, after the scene shifted to after dinner, it was clear that she was very worried. He hadn't come home, and he wasn't at any of his friends' houses. Iori revealed that her earlier talk with the brother had consisted of his thoughts on wanting to help his older sister out more, and Hibiki persuaded Yayoi to go out and search. 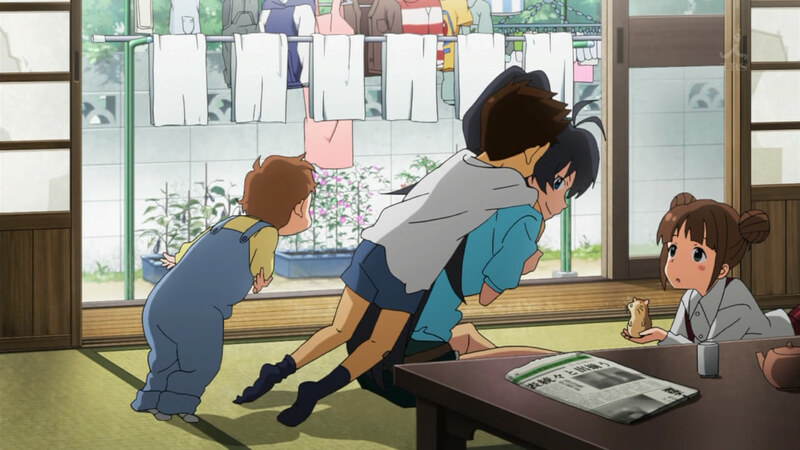 So, while Iori stayed back and watched the younger children, the other two girls ran out to go see where the kid was. Wow, children get scared easily. Iori decided to call Producer, "just in case". She had a relatively easy time getting the younger children to go to bed, which amused me since baby-sitting is usually not that easy of a task. Meanwhile, Iori and Hibiki ran around asking various people (such as convenience store owners) if they had seen the brother, to no luck, when Producer found them. It's weird how he would be needed in such a task, but I guess it's nice that he's looking out for all of his idols, at least. Despite the three sets of legs running around, they were unable to find the brother at all. Meanwhile, Iori (after a talk with Producer about where she would go if she ran away from home) realized that there were a lot of places to hide inside the house itself, and walked to the storage shed to find the brother huddled in a crevice. 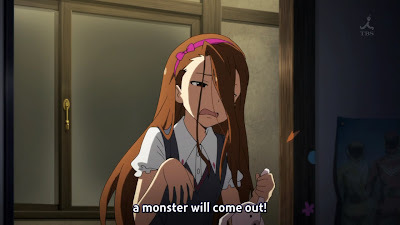 In another surprising move, it was Iori that provided the pep talk to the brother, talking about how she and her brothers didn't get along well at all. However, since the brother wanted Yayoi to accept him, there was no reason for him to run away and get disheartened. He had to keep going, doing whatever little he could to help out, with his head held high. It was a good pep talk, but it didn't keep me from zoning out because the overall theme was still just boring. When the other three got back, Yayoi hugged her brother and all seemed to be well. 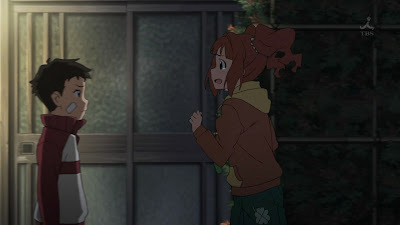 On the walk back, Producer thanked Iori for calling him in a time of need and Iori told him that he needed to do better, and she would call on him more. I hope this much was enough to rebuild Producer's confidence and he now starts actually doing better. Otherwise, 765 Productions is completely hinged on Ritsuko's abilities. 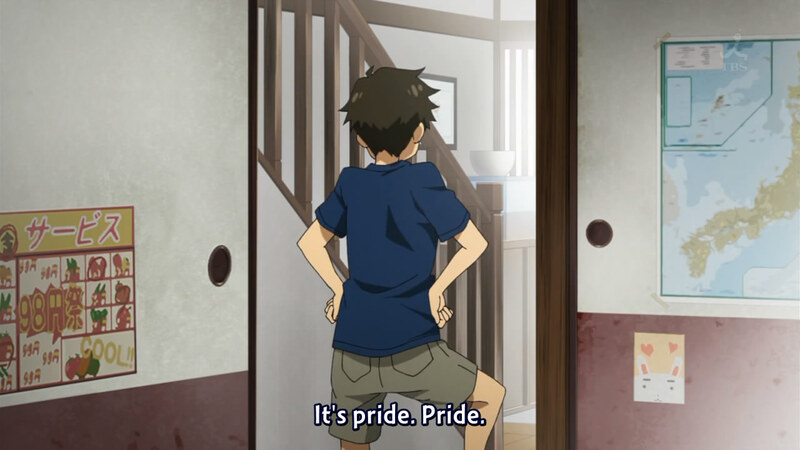 Is it also pride that makes you walk so funny?